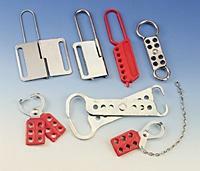 A lockout hasp is used when more than one employee is involved in a lockout:tagout operation. These employees work in a group on the same energy source. The hasps allow multiple padlocks to be used when isolating one energy source such as a piece of machinery or a power switch. The lockout hasp is placed through a latch on the machinery to be locked out and each person carrying out maintenance or service work attaches their padlock through one of the six openings within the lockout hasp. All of the padlocks are then locked. There is little or no warning that a fire has started and that it has quickly gone out of control. So it is extremely important that all preparations for proper egress be made, including signage well in advance and then practiced (drilled) over and over so that there be no mistakes should there actually be a fire. With that in mind, OSHA created the Means of Egress Standard. The first set of signs to be placed would include the name of the WARDENS.They are the people that the employer or someone designated by the employer selects to act as the leaders of groups of employees to assist in leading them to safe locations. Other signage that should be placed at key locations throughout the facility is “Floor Plans” which clearly show the emergency escape routes. The use of color-coding for various groups can aid in knowing exactly where to go to leave the facility quickly. Another important sign would indicate the SAFE AREA to exit to. An exit sign has to be made to withstand harsh conditions, so they should be made from heavy-duty laminated plastic. ADA signs are designed and manufactured for Handicap persons. They follow the guidelines set up under the Americans with Disabilities Act. And with so many more handicapped employees now being hired under that act, these signs are becoming more and more prominent. ADA signs can be found wherever a handicap individual will have to negotiate an entrance, a restroom or a walkway. The signs are generally made with heavy-duty lamination, or from steel or aluminum. All signs must have non-glare backgrounds and characters to help ease the way for the elderly and those with little or perhaps no vision. While these signs are now beginning to be seen in and around factories, they are not the only type of ADA signs. There are also signs for the hearing impaired, people who are deaf and those that may have a mental disorder of some kind. When evaluating the potential for injury to hands while working on equipment, if it is determined that general workplace practice will not in itself provide enough protection then protective equipment must be provided. This includes gloves, finger guards and arm coverings or elbow-length gloves. Machine guards can be shown to provide some protection, but certainly not enough to ward off possible injury. There are many types of hazards that a worker’s hands may encounter and there are many types of gloves that are available for each of the hazards. It is extremely important that workers use the gloves that have been specifically designed for the type of hazard they face. When making the decision of what type of gloves to choose, the following must be considered: the type of chemicals handled, what type of contact will be encountered, the duration of the contact, what part of the hands or arms are involved, what type of grip is necessary, thermal protection, abrasion protection and the size and comfort needed by the worker. J49 CFR 192.707 – Line Markers for Mains and Transmission Lines states: that when a pipeline is above ground that Line Markers must be placed and maintained along each section of a main and transmission line that is located above-ground in an area accessible to the public. Furthermore the following must be written legibly on a background of sharply contrasting color on each line marker: the work “Warning,” “Caution,” or “Danger” followed by the words “Gas” (or the name of the gas transported) Pipeline.” Furthermore, all markers, except those in heavily developed urban areas must be in letters at least 1 inch high with a ¼” stroke. In addition, the name of the operator and the area code and telephone number where the operator can be reached at all times must be included on the sign. The National Electrical Code also has very specific rules governing underground signage. Underground signs are also used to indicate water lines and phone cables. According to OSHA 1910.134, Personal Protective Equipment, when engineering controls are neither feasible, available nor effective in preventing the breathing of harmful dusts, fumes, gases, vapors, sprays, etc., then appropriate respirators must be worn. The regulation goes on to say that the employer must provide each employee with respirators that are suitable and applicable for the purpose intended. There are respirators for virtually every type of operation. For example there are Air-Purifying -Atmosphere-Supplying; Escape Only Respirators to name just a few. Wearing a respirator does not automatically mean that an employee is completely safe from the atmospheric conditions he or she is working in. The maximum use concentration (MUC) is determined by multiplying the assigned protection factor specified for a respirator by the required OSHA permissible exposure limit. The OSHA Fire Protection regulation, 1910.157 states that “The employer shall provide portable fire extinguishers and shall mount, locate and identify them so that they are readily accessible to employees without subjecting the employees to possible injury.” In addition “Portable fire extinguishers shall be provided for employee use and selected and distributed based on the classes of anticipated workplace fires and on the size and degree of hazard which would affect their use. Among the most frequently cited standards by OSHA in 2013 include those involvingLockout:Tagout, Construction, Hazard Communication (including Right-to-Know,) Confined Space, Electrical Components and Equipment.Interesting enough, there are accidental prevention tags that contain verbiage and symbols to help reduce accidents for all of these categories and more. If only they were to be used properly, if at all.Accident Prevention tags can be used to specify rules; to specify procedures; to announce Danger or Caution situations; to announce hazardous conditions; to provide “Right-to-Know” information; to record important data, to name just a few. There are many important items that need the quality long lasting plasticized protection that a desk top laminator delivers. Laminated materials provide protection from weather, abuse, chemical spills and tampering. There are 3 Desk-top laminator sizes: a 4” wide model that is suitable for wallet-sized ID Cards, personalized safety tags, business cards, file cards, driver’s licenses and luggage tags; a 10” wide model that is used for laminating legal and letter sized documents, price lists, signs, 3-hole loos leaf sheets, material safety data sheets and photos; a 12” wide model that is ideal for laminating chart size material and menus. Laminating materials that can be used include clear, matte finish and pressure-sensitive. Shrink wrap sleeve labels are rapidly growing in many industries. Made from polymer plastic film, shrink wrap sleeves offer protection to packages and labels. They are also used to bundle multiple items together. They are often used on bottles drinks and various other packaged products. Spotting a safety sign is hard to miss. They are practically everywhere you see them. They can be found under the sink, on appliances and on the road. The main purpose of a safety sign is to warn the viewer of a hazard or potential danger. You are likely to see several dozen different types of safety signs along roads and highways when traveling. Most safety signs are symbol based, therefore allowing for rapid recognition when driving or reading quickly. Documents and plastic cards tend to wear out and fade after being used for a long period of time. Laminating and sealing anything between two sheets of plastic is an effective way to preserve and protect documents, photographs, business cards, posters, or any other piece of paper that is of value to you. If you wish to laminate something, there are a number of options available to you. Roll laminators, for instance, are the most professional and the most expensive models in the industry. In this modern age of health and safety awareness, a lot of people are skeptical about most health and safety rules. Some people may see it as overkill, bureaucracy gone mad and a pointless creation of jobs. But, these signs if properly installed and observed will prevent countless accidents both at work and at home, and the proper implementation of personal protective equipment rules will minimize the risk of injury at work in a variety of environments. Lasers have many applications these days. They are often used in scanners and detectors, night vision optics, medical applications and industry. However, radiation exposure from lasers can be a serious health risk and it does exist in many items that we come in contact with on a regular basis, such as microwave ovens and cellphones.